The Offset Printing Journal - ZineWiki - the history and culture of zines, independent media and the small press. The Offset Printing Journal is an independent newspaper and online zine based in Toronto, Ontario, Canada. Beginning on 1998, Bill Kozak began publishing an 8 page about offset printing with a circulation of 250. The uniqueness of the journal created a good venue for advertisers to reach a niche market. The newspaper was released at printing trade shows across North America and reached a circulation of 5,500 by 2003. The newspaper then changed ownership. Difficult market conditions led to the end of it's publication in 2005. Following this, the offset printing journal became The Offset Pressman and has since been a weekly updated blog for those that work in the offset printing industry. 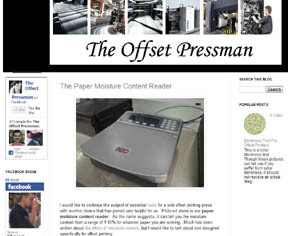 The Offset Printing Journal is now better known as The Offset Pressman today. It is designed to help those that work on offset printing presses to better understand their trade. Topics cover a wide range of subjects from working conditions to technical printing press troubleshooting. This page was last modified on 12 May 2012, at 12:42.